Apple has rewritten and posted the Apology statement for Samsung on their website after the UK Court deemed the first apology unsatisfactory. The Apology has been ordered by the UK Appeal Court in the which Apple failed to prove that Samsung Galaxy Tab were Copy of its iPad. Apple got into this mess because of the ‘very cheeky’ first statement. While Apple were ordered to mention clearly that Samsung didn’t copy its tablets, Apple used parts of the ruling ‘out of context’ to make an inferior image of the Samsung Tablet. The first statement was thus deemed Incorrect by the Court and a rewriting was ordered in 48 hours. 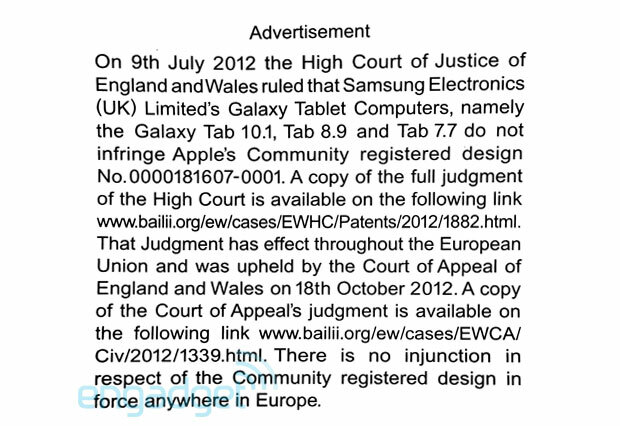 This statement is the part of the judgment which was given by a UK Court on the Samsung/Apple tablet Case. Apple had approached the Court with the allegation that Samsung had copied their iPad design in their Galaxy Tab. The UK Court turned down the claims of Apple and ordered Apple to Publically apologize to Samsung through print media and its website. Apple Appealed which was also turned down. Apple has published the Apology in newspapers as well. With this statement, Apple will surely comply with the judgment of the Court and get the case over with. However this doesn’t mean that Samsung Apple war will end anytime Soon. Apple is on the verge of getting the Galaxy Tab getting banned from US and plan to get more banned from their homeland (including the Galaxy S3). Apple has already got a decision in favor of them which Samsung have to pay US $1 bn. to them.